The Mineola Nature Preserve in conjunction with The Astronomical Society of East Texas will present a STAR GAZING at the Mineola Nature Preserve on Saturday, July 22nd. This is a free program and everyone is invited. The activity begins about 9 PM so you can see where we will be and will end about 11PM. 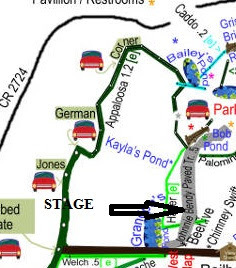 The location will be at the Concert Stage west of Bob’s Pond (see map). The program is a group exercise in identifying objects in the night sky that can be seen with binoculars or the naked eye (Naked Eye Astronomy). We could have a visit from the International Space Station and possible rare signals from Iridium flares that evening. This is a weather permitting program. In the event of inclement weather or cloud cover, the program will be cancelled. A “CANCELLED” notice will be posted in the “Calendar” page of the Society’s website: www.asetexas.org/calendar or our Facebook page on the date, a sign will be posted at the Preserve entrance and an announcement will be aired by radio station KMOO 99.9 Mineola by about 5pm. Please keep an eye on the weather and dress appropriately for it. We have had significant amounts of rain lately, so wear clothing to ward off the mosquitoes. If you bring mosquito repellant, do not bring aerosols; use wipes instead. For more information on this event and the Society, contact us at info@asetexas.com or text to 903-520-7338. On the web at www.asetexas.org or Facebook : Astronomical Society of East Texas and Mineola Nature Preserve.